I love the dynamic between these two people. The man has something to say and the woman is listening. One can see this by each person’s posture: the man leans forward and the woman leans back. Her legs seem to be crossed, even though only one leg is showing. 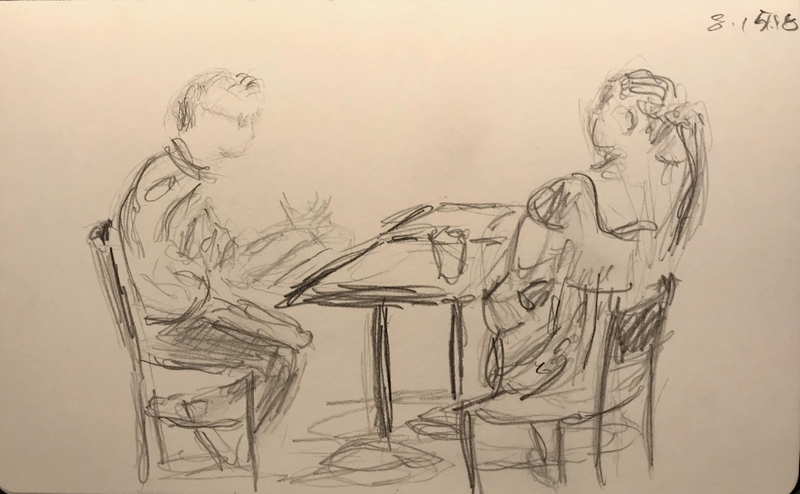 This entry was posted in Personal Stories and tagged 15 minute sketch, artistic process, couple portrait, drawing, gesture, pencil sketch, personal dynamics, posture, sketch, visual art. Bookmark the permalink. Yes. I think he’s trying to persuade her of something and she is non-committal right now. I think you’re right. He’s leaning forward and she’s leaning back.